Believe it or not, Apple still does not support the iPad with its basic Calculator app. And as much as nerds love their calculator watches, there’s no support for Apple Watch, either. If you want advanced features like graphing or unit conversion, you’re going to need to look elsewhere, too. 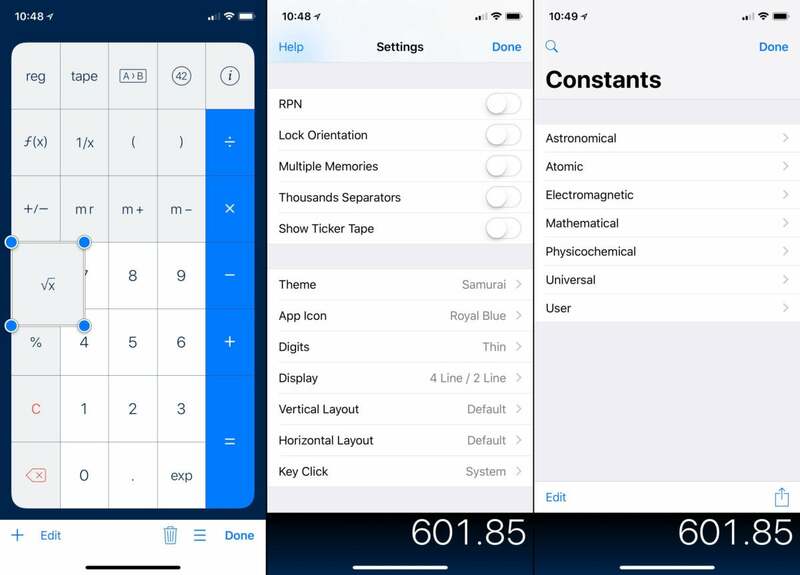 There are certainly plenty of good reasons to grab a third-party calculator app that supports your iPhone, iPad, and maybe even Apple Watch. Fortunately, there are dozens of calculator apps in the App Store. Unfortunately, there are dozens of calculator apps to consider. We’ve spent some time with the most popular calculator apps to narrow it down to a few choice options. 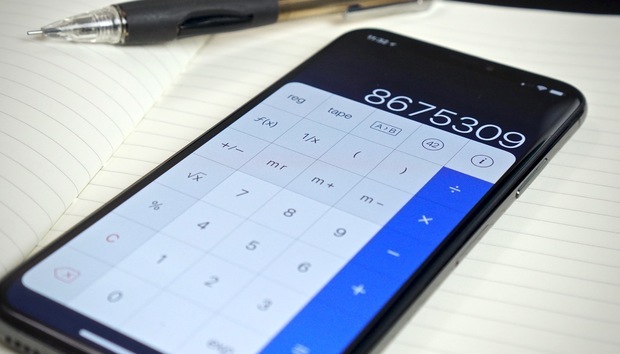 These are our favorite calculator apps for iOS. I know what you’re thinking. “TEN DOLLARS for a calculator app? !” Yes, it’s pricey. Yes, there are plenty of perfectly good, less expensive options. But none of them are as good as PCalc. There’s a reason this one tops the list in a crowded field. You simply won’t find a better combination of features, speed, polish, and interface elegance. Other calculator apps may do well in one or two of those categories, but PCalc nails them all. PCalc’s feature set, speed, and customizable layout are hard to beat. It’s all there. Plenty of layouts and customization options. Unit conversions. Ten memory slots. Customizable 3D touch shortcuts for the main app icon. Easy access to dozens of constants. You can even press-and-hold on any key to change its function and size, creating a custom layout that perfectly fits the way you work. Hell, you can make custom functions if you somehow don’t find the one you’re looking for. PCalc also supports iPad, with a layout that makes sense for the larger screen. And the Apple Watch app not only gives you quick access to a number pad on your wrist, but it does quick unit conversions and tip calculations, too. The one thing PCalc doesn’t do is graphing. 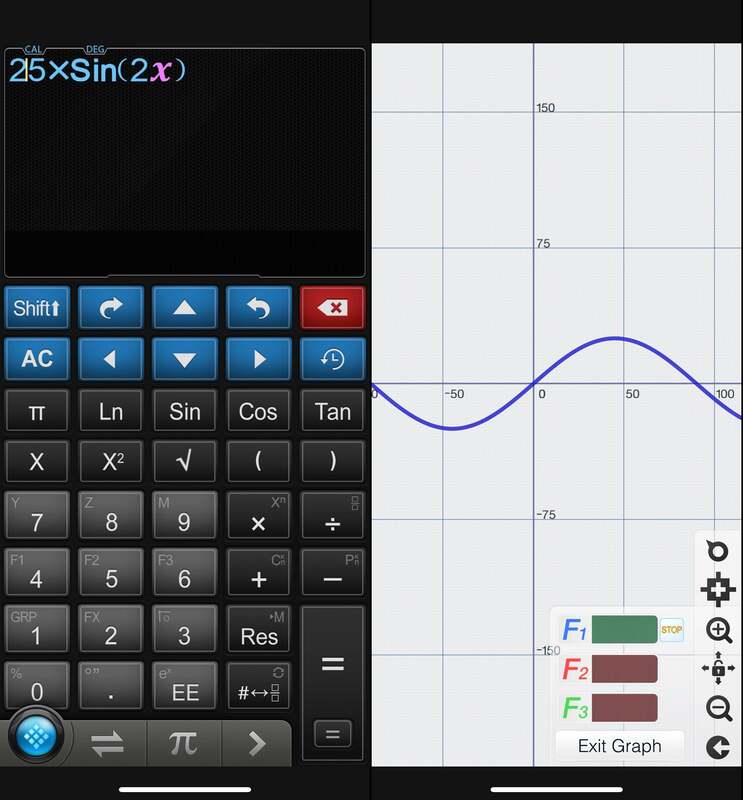 If you’re truly in need of a graphing calculator (which typically means you’re a student), consider Calculator ∞. PCalc Lite is a less-extensive free version that sells individual sets of features as in-app purchases. It’s great for what it is, especially if all you really want is a simple calculator for your Apple Watch, but if you buy all the add-on packs you’ll spend that same $10 price. Most users don’t have real need of a graphing calculator. Graphing is often a nifty distraction that never gets used after the initial “gee whiz” period is over. But students of trigonometry and advanced math often need to check their work on a graph and some engineers and scientists can find the visualizations useful, too. If you really need graphing capability, Calculator ∞ (and the free Calculator #) are excellent options. For those users, we recommend Calculator ∞. It’s loaded with useful features like a long list of constants or linear regression functions. It supports iPad, including multitasking, but there’s no Apple Watch support (as one might expect from a graphing calculator). If the $4.99 price seems a little steep, consider Calculator #, the company’s free graphing calculator equivalent. It’s nearly the same, just with fewer features. For those simply looking to replace a TI-83, it will fit the bill. If you find need of a calculator often but you don’t need advanced functions, we highly recommend you check out Soulver. At $1.99 it’s not nearly as pricey as some others, and it has a nice way of presenting information and performing calculations that is highly intuitive. It really can help you run through a multi-step set of math problems with ease. Soulver’s unique presentation makes it easy to perform and edit a string of related calculations. The basic conceit of Soulver is this: the calculator sits in the bottom third of the screen, with a running log of your operations and results up above. You can use the results of one line to flow in the next line, and see a clear visual representation of that. Then, you can make a change anywhere and see the results update throughout your whole chain of operations. If the first part of your long list of calculations has a 4 you want to change to a 4.025, you can just tap the number way up at the top of your list, change it, and see the whole math chain update in response. Answers are always updated instantly, without needing to press the enter key—it simply exists to end a line so you can use the result in your next calculation. Soulver makes it easy to do some math problems that aren’t always intuitive, thanks to a long-press overflow menu on many of the buttons. If you have $87 to spend at a sale and prices are 45 percent off, you can easily figure out your buying power by long-pressing the % key to reveal the “% off what is” option. 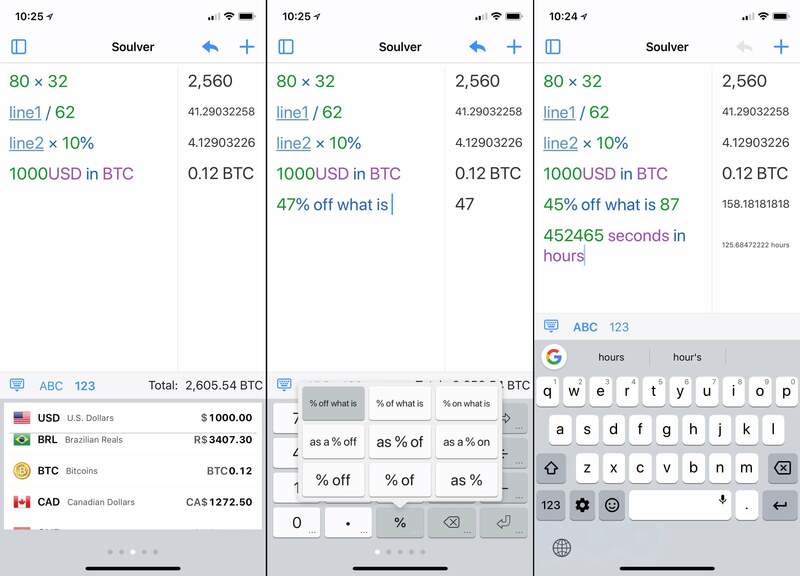 Soulver has some basic trig functions, currency and unit conversion, and logical operators, and you can save your calculations to iCloud or Dropbox or send them as HTML-formatted emails. It’s great for “normal people” who just need to do a string of math every now and then; sort of a combination between a calculator and an easy-to-read spreadsheet. You get iPhone and iPad support, and while an Apple Watch app would be nice, the small screen doesn’t really mesh well with Soulver’s presentation. There are hundreds of calculator apps on the App Store, many of them mediocre. But the apps below, while they didn’t make our cut as the best of the best, they’re still worth a look.